Afrique Ancienne das Alte Africa. 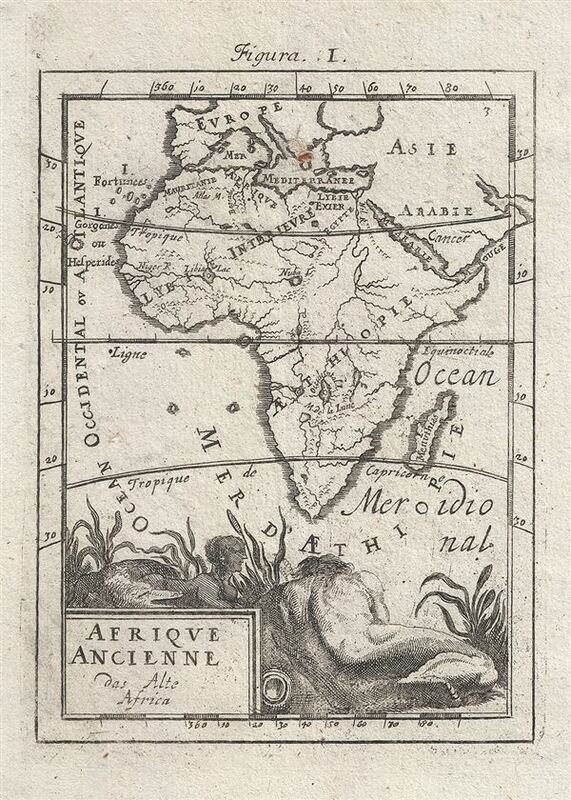 An attractive 1719 miniature map of Africa by Alain Manesson Mallet. Map covers the entire continent of Africa as well as adjacent parts of Europe, Asia, and Arabia. Attempts to illustrate Africa in Antiquity. Shows the Nile according to the Ptolemaic model terminating in two large lakes at the base of the Mountains of the Moon. The jigger river flows inland to its source at Lake Nuba. Roman provinces are identified along the Mediterranean coast. An allegorical cartouche depicting a sphinx, a crocodile, and a heavily muscled man decorates the base of the map. Issued for the 1719 Frankfurt edition of Mallet's Description de L'Univers. Mallet. A. M, Description de L'Univers, (Frankfurt) 1719. Very good. Originall pressmark. Blank on verso.